“Halloween is one of my favorite holidays. I’m one of those people who starts making big plans for costume ideas months ahead of time and watches all the scary movies as soon as they hit Netflix. 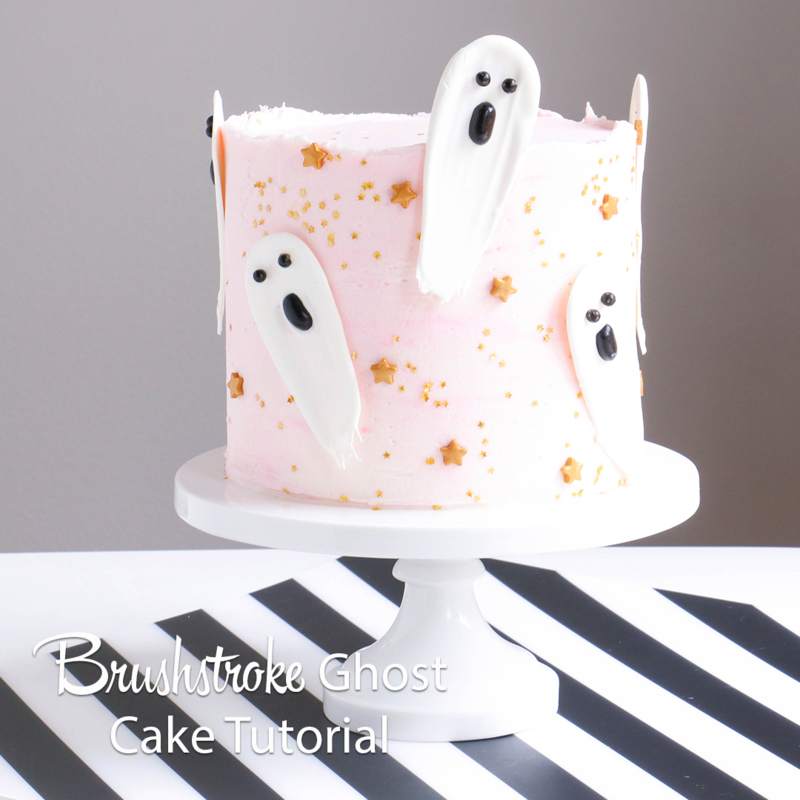 So when I saw Sprinkle Pop’s Halloween sprinkle lineup, I couldn’t help my brain from bursting with spooky cake ideas” notes Whitney of Sugar and Sparrow! 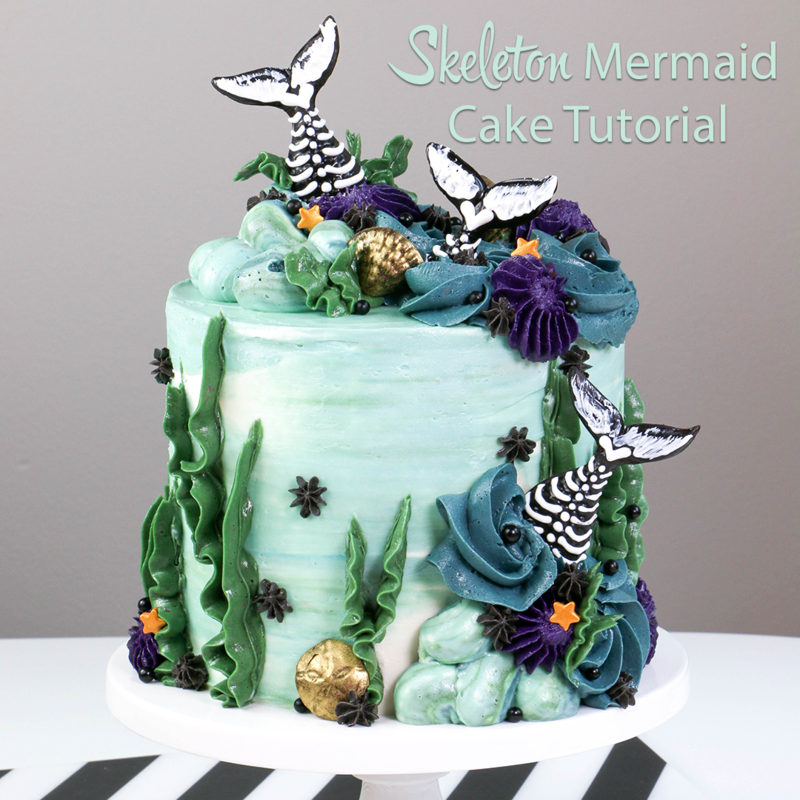 Learn to create this bubbling-cauldron-inspired cake complete with black buttercream and funky sprinkle accents! In the spirit of Halloween, I decided that the perfect backdrop for these Monster Mashup sprinkles is black buttercream. Pitch black buttercream to be exact. Using a floating technique for placing the sprinkles, it almost looks like those googly eyes, mummies, and ghosts are levitating in the dark! To add to the spook-factor, I’ve also topped the cake with some white cotton candy that’s reminiscent of cauldron smoke. And because I’m an ultra Halloween nerd, I also tinted the vanilla cake with orange food color gel underneath it all. Everyone knows orange and black are the signature colors of this horrifying holiday. Muah ha ha ha. I’ve included a full tutorial below for how to make and assemble this cake, from achieving pitch black buttercream to perfectly placing your Monster Mashup sprinkles. Whether you’re in need of a Halloween party showstopper or you just want to make something for the love of spooky cakes, this one’s for you! Going from large amounts of white buttercream to black is near impossible. I’ve successfully tinted small quantities before, but in my experience, the easiest way to turn large amounts of buttercream pitch black is to start with your favorite chocolate buttercream recipe. Since brown is not far from black on the color wheel, you won’t have to use a ton of food coloring to get there. If you don’t yet have a favorite chocolate buttercream recipe, I’ve got a great one for you here! You’ll want to double that recipe to have enough for filling and frosting this cake. To get the best consistency of black buttercream, you need a food color gel that’s so concentrated you don’t need to use the entire bottle. My absolute favorite food color gel for the job is Americolor Super Black. It’s a water-based gel and is so powerful you’ll only need a little bit of color! And best of all, it doesn’t affect the taste of your buttercream at all. Not even a little bit. Once you’ve made your chocolate buttercream, add 2 tsp of Americolor Super Black and make sure it’s fully incorporated. I add it at the end while my buttercream is still in the stand mixer and let the paddle attachment do all the hard work for me. After adding your food color gel, note that your chocolate buttercream won’t be pitch black right away. It’ll probably look a bit like dark concrete. The missing ingredient here is time. In order to let that food color gel work it’s magic, you’ll need to add your buttercream to an airtight container and stick it in the fridge overnight. In the morning, bring it back to room temperature and whip it all back up in your stand mixer. 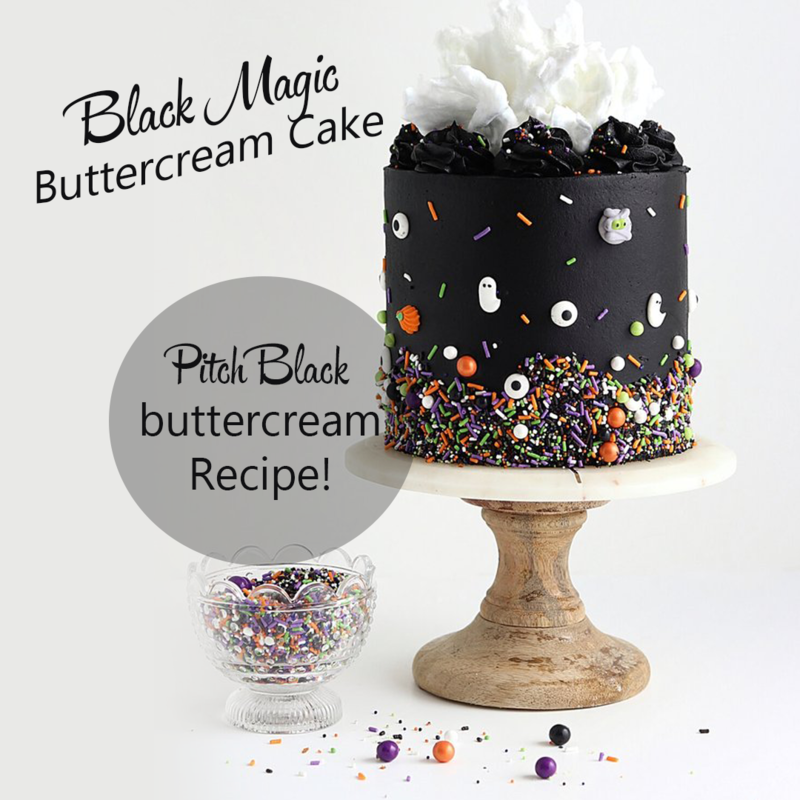 What you’ll end up with is pitch black buttercream magic! While your buttercream is setting in the fridge, whip up your favorite vanilla cake recipe and add a few drops of orange food color gel at the end to tint the cakes. Bake the cakes according to your recipe instructions and let them cool completely before torting the layers to your desired height. Once your cakes are completely cool and leveled, fill and frost them with your black buttercream. I’ve created a smooth black buttercream finish as the backdrop for my sprinkles. 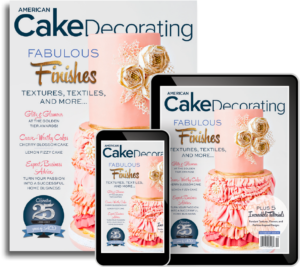 I use an offset icing spatula and bench scraper to achieve the perfect smooth buttercream finish, and if you need additional tips on how to create this look, you can check out this blog post on how to get the smoothest finish ever. Now for the fun part: adding the sprinkles! To achieve the floating monster sprinkle look, reserve some of the googly eyes, mummies, and ghosts from your Monster Mashup sprinkle mix and set them aside. While the buttercream is still soft enough for the sprinkles to adhere, pour a handful of the Halloween colored sprinkles into your hand and place them around the bottom of the cake. Cover the entire bottom third of the cake this way, making the top edge of the sprinkle border slightly uneven as you go around. Once your sprinkle border is complete, take the monster sprinkles you’ve reserved and place them one by one around the top two thirds of the cake. It looks best when there are more monsters toward the bottom and less toward the top. I’ve also chosen to add some of the colored jimmies one by one to fill in some of the blank spaces. When your spooky Monster Mashup sprinkle placement is complete, prepare a piping bag by fitting it with Wilton Tip 1M or another favorite piping tip of yours. 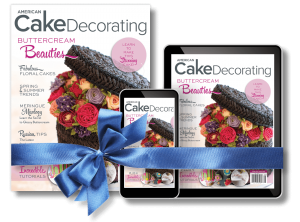 Fill the piping bag with black buttercream and pipe a border around the top of the cake. I’ve chosen to pipe a few swirls around the top of the cake and sprinkle with more Monster Mashup sprinkles. Stretch out the white cotton candy so it looks a little more like cauldron smoke and less like a clump of cotton, then place it on the top of your cake. How cool is this cake? 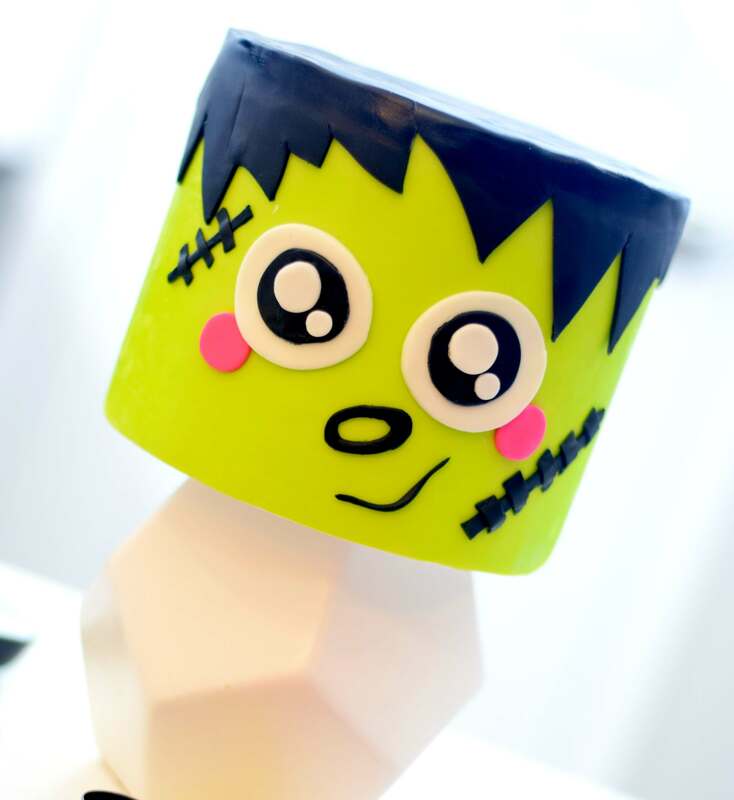 Definitely a showstopper for your Halloween festivities! This design will work with any of Sprinkle Pop’s Halloween sprinkles, but I think the Monster Mashup does the trick quite well. Happy Halloween month to all! I’m a self-taught baker, cake decorator, wifey, and homemaker living in Portland, Oregon. When I’m not baking up a storm in the kitchen, I enjoy a good long run, traveling to new places, making music, and getting lost in a thrilling novel. Creativity is a huge driving force in my life, and while I enjoy a variety of artistic mediums, sugar is hands-down my favorite. I inherited a love for baking from my mother, who was the queen of lemon squares and casserole dish birthday cakes. As a kid I can remember flipping through her vintage baking books and attempting to recreate every single recipe. 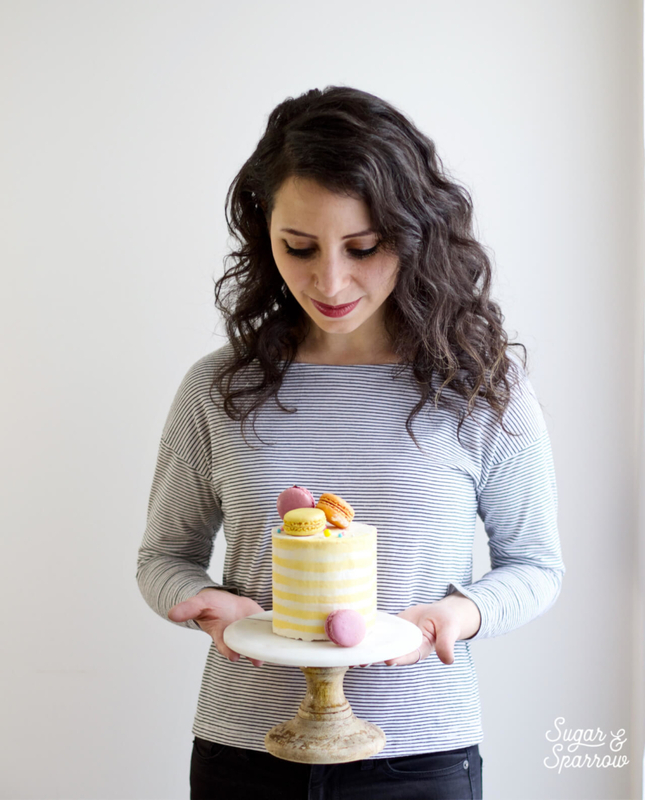 That passion for baking evolved into a fascination with cake decorating, and I spent a good amount of years whipping up custom cakes from my home kitchen. Being self-taught every step of the way, I’ve gained quite a few tips, perfected recipes, and have overcome my fair share of kitchen fails. Sugar & Sparrow is my little space to share everything I’ve learned with you in hopes of helping you bake pretty desserts with confidence!